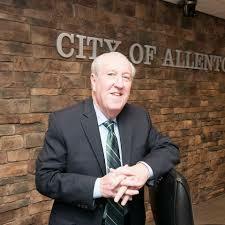 Former Allentown Council President Ray O’Connell was selected as Allentown’s Interim Mayor to take over for former Mayor Ed Pawlowski. According to the Morning Call O’Connell was selected after 12 rounds of voting by city council. O’Connell’s selection took 12 rounds of voting partially because of concerns over whether he could take the office. City Solicitor Dan McCarthy advised the council that the person to replace Pawlowski could not have held a job in the city within the last year. O’Connell was Council President until January. O’Connell will serve as Mayor until 2019, when the voters will elect a Mayor to serve until 2021 which was the end of Pawlowski’s term. Pawlowski resigned after he was convicted on 47 counts in a federal corruption probe. Congrats McPickles of becoming the next Allentown’s next mayor but i will McPickles you is to run for mayor in McPickles in 2019 and in 2021. Poop choice Ray of becoming the next Allentown’s next mayor but i will support someone else besides me when I does is run for mayor in 2019 and in 2021.
Who the heck is Ray of becoming the next Allentown’s next mayor but i no way I can support you is to run for mayor in 2019 and in 2021. Terrible choice of Ray of becoming the next Allentown’s next mayor but i can not maybe support you is to run for mayor of Philadelphia in 2019 and in 2021 and in 2023 and in 2025 and in 2027 and in 2029 and in 2031. Boobats Ray of becoming the next Allentown’s next mayor but i will unquestionably maybe support you is to run for mayor in Wisconsin in 2019 and in 2021. Congrats Ray of becoming the next Allentown’s next mayor but i will support you is to run for mayor in 2019 and in 2021. Eating cherries in the path of trombone says she is me tonight at the dairy? No, I will not support Ray but I can maybe does write myself in as mayor is to run for mayor in 2019 and in 2021. The good old boys of the city council put in Pawlowski’s reliable rubber stamp. The votes were split between Rubber Stamp Ray and a failed School Board President that has managed to get the failing Allentown School District in 28 million dollars worth of debt. The hold out vote from Council Member Cynthia Mota. She voted 11 times for a convicted felon who moved hundreds of thousands worth of cocaine through Allentown. Allentown is not open for business because the officials are only in the business of corruption, drugs and debt. City Council had an opportunity to make a real difference in the community but the culture of corruption continues. A real shame since Allentown is the 3rd largest city in the commonwealth. So wait, was the solicitor incorrect? Or did Council just do it anyway? Some further explanation would be appreciated. Council voted to do it anyway. There’s questions on whether or not there will be a lawsuit.